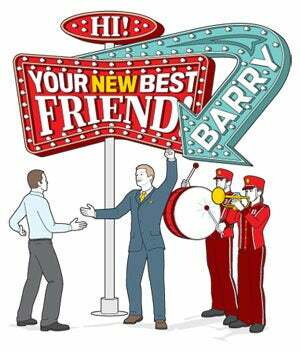 This isn't about the obligatory, "Hi, my name's Barry. Nice weather, huh?" This is about an introduction that you initiate as a prelude to something more meaningful. Introductions at a party or networking event, animated by a goal: to make your business known, to learn something specific or just to, uh, meet in person (an increasingly archaic concept involving two people forgoing social media interaction for the exchanging of pleasantries in real time). By way of introduction, let's talk about the worst possible way to introduce yourself. (Note: This example is based on a recent incident in the Esquire offices.) A man walks into a meeting room for an informal chat with a group of strangers. High energy, boundless enthusiasm, serious personal engagement. A person who clearly considers the introduction to be an art form--a ballet of name-memorization, small talk, handshaking and eye contact. A lot of eye contact, actually. Too much. He goes around the room shaking hands, introducing himself, looking each person in the eye for about five seconds and saying each of their names twice. Now, five seconds is a long time to stare at someone you don't know while they're repeating your name back to you and gripping your hand. (Find the person nearest you and stare at them for five seconds. You'll see. Stare that long at even an inanimate object and you'll start feeling weird.) The approach is intended to establish a connection--to make everyone feel comfortable, to really try and get to know someone in that ripe moment of initial contact via body language and mental telepathy. The result is the opposite of that. This introduction is too familiar, too orchestrated, too intense. The lesson: The introduction is an overt act that must be performed in a restrained way. If you do it overtly, you're piling on more weight than the situation can handle. So, easy on the intro. Your personality should seem well-balanced. If you're naturally glum-seeming, be slightly less so. If you're naturally fun-seeming, be slightly less so. If you're naturally a creep, maybe stare into the other person's eyes for two seconds, rather than five. The introduction is about power and instinct. Which is why it can seem so fraught. When we meet someone for the first time, we're like animals in the wild. The prefrontal cortex (the area of the brain right behind the forehead) is working hard to identify danger. The gut feeling we get when we meet someone for the first time is the activation of automatic survival systems. When we meet someone for the first time, "the region that would assess this information in the wild is assessing information in the same way," says Daniela Schiller, cognitive neuroscientist and assistant professor of psychiatry and neuroscience at Mount Sinai's Icahn School of Medicine. "It's these systems that draw your attention to dangerous and safe things, that are related to reproduction and food, things like that--these regions would react in the same way, but it's not as if that person is a real threat physically; it's a social threat." So, your demeanor should be subtle, which proves to your counterpart that you're not about to eat them, and also provides a backdrop to the words you speak, which should be forceful. "You want to be succinct in explaining who you are, and ready to make inquiries about the person you're meeting," says Mark Tercek, who, as president and CEO of the nonprofit organization Nature Conservancy, does a lot of meeting and greeting in order to raise funds. "If you just go on and on blabbing about yourself, that's quite a turnoff. So part of preparation is to have some good and appropriate questions." It helps to state your goal slightly faster than polite conversation usually allows for. Everybody wants something. You know it, they know it, the guy over there knows it. The introduction works best when the goal--or at least some hint of the goal--is explicit. Then let the other person have the floor. "Ask people more about them-selves than you speak about yourself," says social media strategist, author and entrepreneur Tara Hunt, a pioneer of online marketing. "People go to networking events eager to sell themselves, their product, their services, and to let people know how awesome they are so they'll make these great contacts, but in reality that's not how to approach the conversation." With a face-to-face introduction, you're offering more than your name and your hand. You're offering temporary access to an exclusive world--and whatever favors and privilege might result from that access. You're offering a relationship. You're requesting all of this from the other person, too. The manner of introduction is an underrated thing, considering how much value is being traded for free. The only cost is a handshake, a smile and the immediate disclosure of what it is you're up to--good things that can lead to better things. The proper introduction is a hopeful, honest thing. Which makes it great for business. 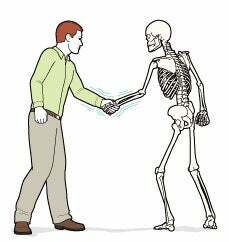 Remember that meeting a person for the first time at an event is like two animals meeting for the first time in the wild. Instinct and suspicion kick in. Even the subtlest actions are noted. Essentials: eye contact, a smile and a firm handshake. Four shakes will suffice. Anything more and it seems like you're trying to hold the other person until the police arrive. A proper introduction should cover a lot of ground within the first few seconds: your name, your job and a rough idea of the point of the introduction. It should not cover where you went to school, your favorite color growing up or the fact that the passed hors d'oeuvres don't seem to be sitting well. The best thing about introductions is that they're over with as soon as they begin. Unless you won't stop shaking the other person's hand. It's spectacular to meet you. It's nice and spectacular to meet you. Funny how two like-minded professionals always end up chatting. I want what you got--business-wise.